To teach what's right, you must know what's wrong. 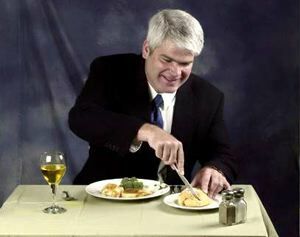 In these photos, Robert Shutt demonstrates some dining faux pas; can you find the errors? Were you able to spot the two things wrong with this photo? 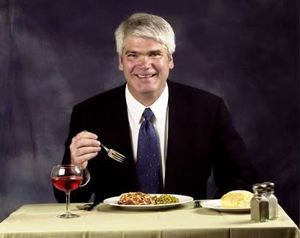 Etiquette expert Robert A. Shutt has ordered spaghetti and peas -- two items that are extremely difficult to eat. If you're trying to impress, stick to foods that are easy to cut with a fork and knife. They'll be easier to handle and less likely to spill, causing awkward moments. Make sure you choose the right fork to eat with. Shutt is using his salad fork instead of his entree fork. 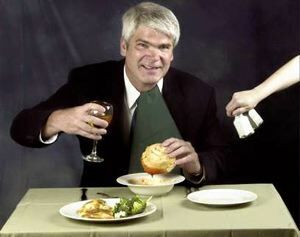 There's only one major mistake in this photograph: Shutt is using a knife to cut his dinner roll. The correct way to eat a dinner roll is by breaking off small manageable pieces by hand. If you are drinking a glass of white wine, make sure to hold the glass by its stem. Otherwise, you'll warm up the wine with your body heat. If you drank a chilled beverage before the meal while networking, and hold it by the bowl you will have "moist" hands, which is not ideal for a handshake. Shutt recommends, however, that one does not order any alcohol when out on a job interview -- even if everyone else orders wine. It's a bit hard to see, but there is a used spoon sitting on the tablecloth. That's a big no-no. If you've used a utensil, it stays on your plate. Dunking gigantic pieces of bread into your soup is impolite. Use the saltine crackers that come with your soup instead. However, don't crush the saltines inside the bag first before dumping them into your soup. Break small pieces off by hand. Other soup etiquette rules to keep in mind: No slurping from the spoon; spoon the soup away from you; don't blow on it if it's too hot -- wait until it's cooled down first; and don't put ice cubes into it. Napkins belong in laps, not tucked into the neck of a shirt. When passing the salt and pepper, do not grab them by the tops. Pass both at the same time, holding the bottoms of the shakers.